His excellent work ethic, commitment to quality and service - combined with his high profile generated by extensive television work - make Marty a smart choice for your next corporate gathering. As a Comedian, Marty is a rapid-fire power station of material and one of the genuine big guns on the Australian comedy circuit. He began his stand-up career in 1987, playing the comedy circuit in hotels and clubs all over the country. Marty has a comedy radio show that is networked to over a 100 stations nationally. As the best selling author of three comedy books, Marty is recognized as Australia’s authority on one-liners for every possible topic. His corporate comedy performances have been praised for the past fifteen years by regular clients. These clients include Toyota, Coca Cola, McDonalds, Ford, The AFL, BHP, Telstra, Shell, IBM, Beaurepaires, and Cadbury. An accomplished pianist and songwriter, Marty has produced many specialized songs, jingles and music for events and companies and individuals, as well as being able to add piano/vocal comedy to his standup performances, which can often add that special difference to an event. 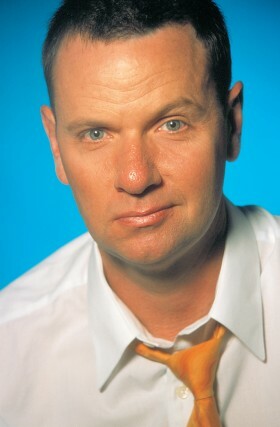 In 2005 he was inducted into the Australian Comedy Hall Of Fame. Marty is considered one of our great comedy exports, and has performed all over the world, including headlining for a week at the New York Comedy Club in Manhattan. His attention to detail as well as his ability to tailor his act content to suit all types of audiences and tastes without sacrificing laughs, sets Marty apart as one of the premier corporate comedians in Australia. Well recognised from his five years on Hey Hey it's Saturday, The Battle of the Sexes, Blankety Blanks or his character Roy Holland on Blue Heelers, as a Host/MC Marty combines his unique style of humour with a finely tuned sense of propriety and occasion. His attention to detail, charisma and twenty years of involvement in prestigious corporate events, makes Marty one of the most sought after MCs in the country. He has hosted successful and diverse functions for most major corporations, both in Australia and overseas, including CUB, Castrol, Nestle, Coca Cola, The PGA Tour and TT Line. Marty has presented many awards nights including The Australian Music Awards, ADMA Awards, A.G.C. Awards, the NSW Retail Awards, Australian Greeting Card Awards and the Network Video Awards, as well as various major sporting events and fundraising auctions. Marty has anchored many major corporate roadshows, traveling the country and the world with presentations for Sensis, Hilton Hotels, Beaurepaires and Microsoft. He has developed impressive interview abilities and has chaired many lively Q&A sessions. Marty also possesses unique auctioning skills and brings humour and excitement to any fundraising auction, having been the host of the weekly auction television program, Bid On TV for the Nine Network. Marty is experienced, meticulous and entertaining. "This man is top of the omega range. He’s sensational. I have never laughed so easily." - Bill Thompson – Sunday Times, W.A.